A University of Ulster Fine and Applied Arts student has won the chance to exhibit his work at the prestigious Saatchi Gallery in London. Stephen Johnston, a final-year painting student from Clough in County Down, was chosen from over 500 entrants from across the UK and Ireland as a finalist in the Art of Nurture Lloyds TSB Commercial Finance competition. Stephen won the North West regional heat of the competition held in Manchester earlier this year scooping prize money of £250 with his painting entitled My Watch, and went on to join 18 other regional finalists at the Saatchi Gallery exhibition. 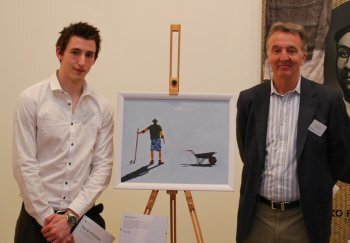 This is the third year running that a University of Ulster student has achieved success in Art of Nurture competition. Half of the prize money totalling £20,000 over the course of the three years goes into a university fund used to finance field trips for painting students and to purchase art materials for the painting workshops. “This is a wonderful achievement for these young artists considering that they are competing with hundreds of people from all over Ireland and the UK, this reflects the high calibre of students who choose to study at Ulster’s school of Art and Design,” added Mark.